Never touch your avatar photo. I received this sage advice from a fairly prominent social media person to never change your avatar photos, particularly your Twitter photo. It is your brand and people who skim through their long long Twitter streams need to recognize you immediately. Last Saturday, at the inaugural meeting of the Centre for Digital Heritage at York I spoke to Andrew Prescott who told me that I was shorter than my Twitter avatar appeared. I laughed–I have gotten various reactions over the years from people who have met me offline after getting to know my work online. After finishing the PhD last December, I had to rove around various sites, updating profiles and amending CVs, updating my new social media reality. I didn’t touch my profile photos. Still, this presents a dilemma for those of us who have been online…awhile. My Twitter photo is from the same year I signed up for the service–2007. Interestingly, Google has a patent on the aging and the removal (!) of avatars–this centers more on inaction within virtual worlds rather than a temporal span, but leave it to Google to own virtual death. According to Google, aging online means that you lose resolution, become pixellated and finally are scattered back into the binary haze from which you came. Perhaps a slightly more palatable solution could come from the numismatists. 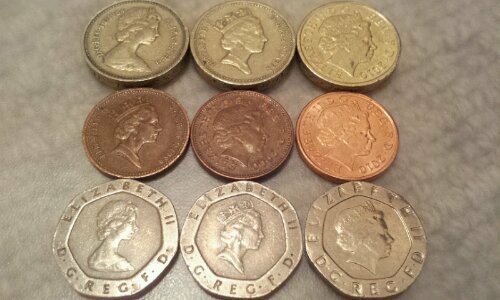 I was shocked when I discovered that the portrait of the Queen of England ages on the coins issued in England and associated countries. After all, I’m American and dead guys on coins look the same forever. Every few years there is a new portrait of the queen on the coins, though older coins still circulate. I also recently found out that the portrait will flip when whoever succeeds her gets on the coins. A strange business, constitutional monarchy. Perhaps we could all just version ourselves. Colleen 1.0. Colleen 2.0. Colleen 2.5, the PhD edition. Anyway, my younger self still holds forth on Twitter, and there will likely be a time that we will be represented with up-to-the-minute 3D scans, but for now online embodiment remains fluid, an essential self, rather than a true self. I’m probably doing the internet wrong, but the advice you were given doesn’t fit my way of using twitter – I definitely scan through names before avatars (in fact, without looking I couldn’t tell you what your avatar is nor that of the three or four people I correspond with most frequently). I actually feel that the layout of twitter both on my laptop and phone makes scanning names and then the messages below them more informative than avatars, which are quite marginal really, but that could just be me.